Dan & Lynda invite you to visit their pottery & basketry studio, or watch coffee being roasted in a circa 1919 Flame Roaster. 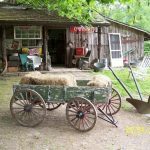 Head out to the barn for antiques, collectibles, & other home or garden décor items. Character buildings, chickens, goats & of course our family vegetable gardens make this a fun & relaxing experience. Open Thurs – Sun: 10 – 5. Closed Easter Sunday & December 25 to February 16.